Is Personalization Saving Us or Ruining Us? Yesterday, while scrolling through my Instagram feed, I suddenly realized that I loved all the products I was seeing via the sponsored posts. It was all I could do NOT to click on them, which made me realize how social marketing has evolved to become not only pervasive but incredibly and irritatingly personalized and persuasive. I remember back to just a few years ago when direct marketing was making the push to personalization through postcards that contained our first names, imagery that aligned with our age and gender, and even links to personalized URLs where customer relationship marketing could be cultivated even further. Now technology has allowed marketers to move well beyond that with sophisticated campaigns that track not only who we are, where we live and what we like, but where we came from, where we left to go to, and our shopping behaviors and journeys themselves. Have you heard of these marketing terms? Retargeting: This is when companies create custom, segmented campaigns specifically targeted to a frequent user’s behaviors. Examples of retargeting may take the shape of immediately showing you items you’ve searched for when you go back to a website, or sending you an email to remind you that you’ve left something in your cart. In this personal retargeting example from Target (no pun) I was informed that an item I actually wanted had now gone on sale. Behavioral and Goal-Based Personas: You may think of yourself as a person, but to a marketer you may also fit into a persona. By understanding who someone is and how someone engages with a business (do they spend a long time or short time online, do they buy frequently or leave things in the cart, do they have children or own a house) companies can actually inspire you to buy things you didn’t even know you needed. 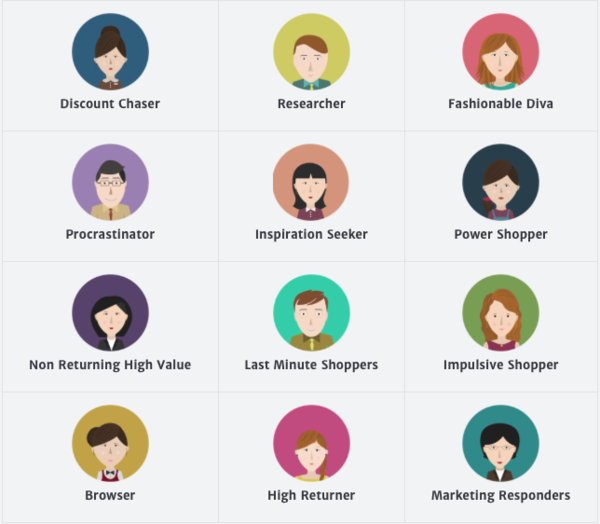 This chart from Artifacia, shows the 12 Buyer Personas for online retail shoppers. Which one are you? Mapping the Touchpoints: Journey mapping and analysis allows marketers to understand the particular steps you’ve taken before ultimately making a purchase. They might analyze the number of visits, the devices you’ve used, the time-of-day you’ve come or how you’ve engaged with their site. They may look at whether you’ve read the product reviews, entered coupons, or explored complementary products. By actually mapping your customer journey, they can make your searching more efficient and your buying more expedient. All in all, it will allow for a better customer experience. As a marketer I am excited by the opportunities for disruption, engagement and action. As a consumer, I am thankful that my most precious commodity (time) is being considered and I can move swiftly through the shopping cycle to buy what I need (including things I didn’t even know I needed but probably do) and get back to my life. At the same time I fear I am exhibiting symptoms of familiarity fatigue (yes, I made that up) and I am afraid of what I might be missing. Because I fit so neatly into one box, can I ever get out? I now notice that despite visiting numerous retail sites, all my searches net the same results. And now I wonder, if I typically buy home furnishings that fall within the categories of contemporary and modern design, will I ever see those one-of-a-kind antiques? Or is it merely that all things are in fact the same, because we all want the same things? And while I have no answer yet, perhaps this debate is less significant in importance than the danger of having such personally curated items embedded within my social feeds. I am afraid that as a consumer, the end of my shopping journey (in case you’re one who is mapping) will ultimately be the poor house.